How Can I Identify the Apple iPad 3? 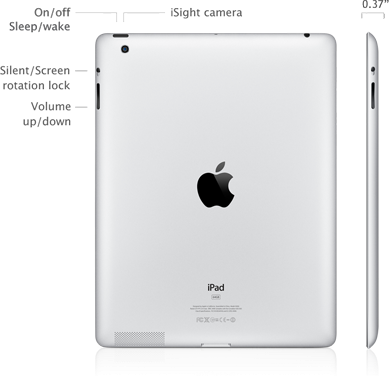 You are Here in Home » How to » How Can I Identify the Apple iPad 3? I upgraded from iPad 1 to iPad 3 yesterday. My lil bro helped me to buy it in Lagos, Nigeria and sent it down to me in Benue. On getting it, I just couldn't identify if it is an iPad 3 or iPad 2. All I see on the back is "iPad 64GB.....Model A1430". So, I turned to Google for help and I was able to get some tips on how to identify the Apple iPad 3, which I've decided to share with you. If you are at a store to buy iPad3, you can identify it by not unboxing it if you can find the Order Number (Part Number) on the packaging. The order numbers for the 16 GB, 32 GB and 64 GB configurations in white are MD369LL/A, MD370LL/A and MD371LL/A, respectively while the Order Numbers for 16 GB, 32 GB and 64 GB configurations in black are MD366LL/A,MD367LL/A and MD368LL/A respectively. I highly recommend you unbox it to confirm the model of iPad you have with you because someone might mistakenly package an iPad in a wrong box. To properly identify your iPad 3, look at the back of the device near the center bottom. If you look closely at the fine print, you’ll see ‘Model’ and a 5 character model number beginning with the letter ‘A’. For example, my iPad is Model A1430 – an iPad 3rd Generation 64GB WiFi + Cellular model. Once you have your 5 character model number you can check it against Apple’s listing of all iPad models, found here. Right there, you will know which generation your iPad is, when it was released, and whether it is a WiFi only model or WiFI + Cellular. If your iPad Model Number is A1416 you have an Apple iPad iPad (3rd generation) Wi-Fi. If your iPad Model Number is A1403 you have an Apple iPad iPad (3rd generation) Wi-Fi + Cellular (VZ). If your iPad Model Number is A1430 you have an Apple iPad iPad (3rd generation) Wi-Fi + Cellular. After you might have powered ON your device, you can also identify your iPad 3.
iPad 3 has a voice dictation integrated on the on-screen keyboard (little mic on the left side of the space bar). In case you don't know, Siri works only on iPad 3 running iOS 6 or later. It doesn't work on iPad 2. You can also go to "Settings" > "General" > "About" > "Diagnostics & Usage" > "Diagnostics & Usage Data". Tap one of the files and look for the line, "Hardware Model: iPad 3,3". That's all you need to know if the iPad you have is iPad 3. If you know other ways to identify iPad 3, kindly share via comments.